It’s time for a change of guards in Pakistan. The most powerful office in the country is awaiting its new occupant, General Qamar Javed Bajwa, the COAS nominate. General Raheel Sharif, unarguably the most popular, most loved, Chief of Army Staff in the history of Pakistan, completes his glorious term on 29 November. It seems that the popularity of General Raheel Sharif has sent a wave of insecurity among the civilian ranks. The armed forces have been facing a defamation campaign that has emerged from the wraps slowly during the past three years. With the recent stunt of the infamous Dawn Leaks, the smear campaign has been revealed for everybody to see. People close to the Prime Minister seem to have instigated this campaign and brought it to its current state. This conclusion is easy to arrive at once we realize that the twice ejected PM Nawaz Sharif has a history of confrontations with the esteemed institutions of Pakistan, especially with military heads. He tried to force retirement on more than one military chiefs during his previous two terms. General Raheel Sharif was appointed by Nawaz Sharif himself after General Ashfaq Pervez Kiyani completed his term in 2013. 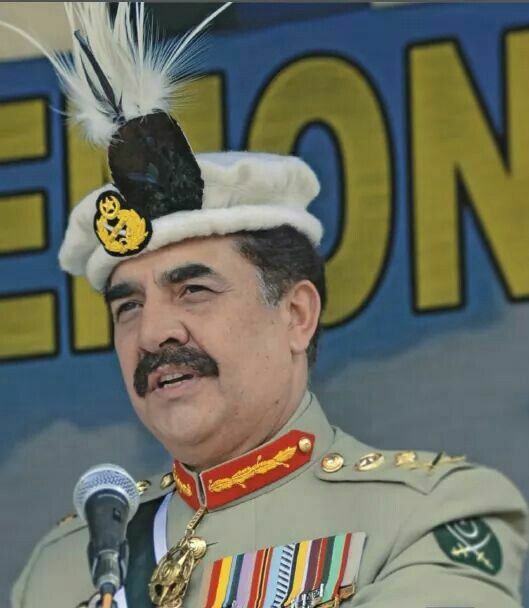 A son to Major Muhammed Sharif, Gen Raheel is a soldier in blood and spirit, brother to Major Shabbir Sharif Shaheed, who was awarded Nishan-i-Haider – Pakistan’s highest military honor – for giving his life in the war of 1971. As Chief of army staff, General Raheel continued his family’s legacy of serving the country to the best of his capacities. He initiated the National Action Plan under which terrorism and corruption were to be eradicated from the country. Operation Zarb-i-Azb was also initiated by Gen Raheel to eradicate terror networks based in the tribal belt of Pakistan where terrorists from across the Afghan border have easily entered Pakistan ever since the War on Terror began in 2001 and carried out terrorist activities inside Pakistan with the help of local mercenaries. General Raheel Sharif also initiated a clean-up operation in the economic hub of Pakistan, Karachi, which was badly affected by some political parties’ backed lawlessness, terror attacks, gang wars, and drug lords. Most of them were dismantled and Karachi is almost back to her old peaceful self. Since the day General Raheel Sharif emerged as a strong and popular Army chief, the civilian leadership have untiringly attacked him and the institution with the most inappropriate insults. People sitting on key government posts take pride in smearing the armed forces of their own country. The recent infamous incident of the so-called ‘leaked’ news story appearing on the front page of Dawn, a popular English newspaper of Pakistan, has created an uproar in Pakistan and a pleasant excitement in certain quarters. Indian media loved it. Pak Army, despite their huge and genuine efforts to put things in order, has gone to the back foot. General Raheel Sharif and his team’s hard work of years to build Pakistan’s image went down the drain because of one planted and crafted story that was aimed to label military brass as facilitators of terrorism. On this horrendous security breach, Pakistan’s Minister of Information Affairs became PM Nawaz’s sacrificial goat and was sacked after the military leadership was livid over the con. The most horrifying part of this ‘leak’ was the impression that things discussed in such highly sensitive meetings are not safe. Such people who wanted to damage the Army have somewhat done it, while the government, with their ever-changing statements, have strengthened the notion of complicity in this scandal. According to the Federal Interior Minister, the writer of the scoop called the sacked Information Minister for a comment on the story, as is the custom in journalism. This automatically means some people in the civilian government were in the loop before the story was published. The question is, why didn’t the minister deny or stop the story from going public? Or was there somebody more powerful who wanted the story to be published? This story meant harm. The enemy’s narrative made international headlines. Keeping PM Nawaz’s skirmishes with other state institutions and controlling nature in mind, this move had ulterior motives towards the end of General Raheel Sharif’s shining career. This conspiracy was aimed at putting the armed forces on the defensive and to tell the future military command to read between the lines. Incidentally, Former PM India, IK Gujral, writes in his book that Nawaz Sharif passed on secret information to India while he was Pakistan’s PM. Nobody from Nawaz Camp has ever denied this highly incriminating statement. In light of all the events occurring in these crucial times for Pakistan, is the security of the country in safe hands with the current political leadership? That is the big question for every Pakistani today. Bravo Gen. Raheel Sharif for not only dismissing the corrupt generals, brigadiers, colonels and majors but also recovering the ill gotten wealth from them. Sir, we have a large army and there could be quite a few more such corrupts around, especially among those who have had the opportunity of serving in or with the civil departments. May I suggest that an Operation Cleanup be launched wherein all serving and retired military officers of the three services be asked to make confessional statements of any corruption done by them. Those who make honest confession and reimburse the ill gotten monies to the exchequer be treated leniently and only dismissed from the service. But those officers who indulged in corruption and did not make the confessional statement, and are detected later, be court martialled and sentenced to imprisonment along with confiscation of their moveable and immoveable properties. May be the Provincial and the Federal governments also follow suite and we have a pure and Pak Pakistan. Sir, you will do this hapless nation a great Messianic favour. It was indeed comforting and reassuring to see the indefatigable Gen. Raheel in Fort Abbas attending a briefing of the army carrying out exercises in that area the very next day of his being with the troops fighting the extremists in the forward most areas of North Waziristan. As a true defender of Pakistan if he is fighting the terrorists in FATA on the one hand, he is on the other hand not oblivious of his responsibilities also to defend other areas of Pakistan such as the soft underbelly of Pakistan – the Cholistan front, where at places India is only 8 miles away from the GT Road to Karachi. Well done, Sir, the veterans like me are proud of you as a soldier as well as a commander and wish you Godspeed in your all undertakings. May Allah (swt) be with you always to protect you and guide you, ameen.